Distribution insulators are engineered to mechanically support power lines while safely insulating any surrounding objects from conducting voltage. Insulators maintain a non-conductive air gap that separates the conductor from a ground path and resists electrical, mechanical and even environmental stresses throughout the distribution system. Peak Demand offers a complete line of high quality and proven distribution and sub-transmission level insulators. 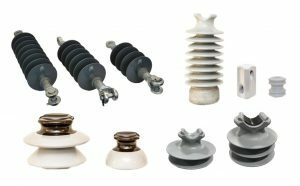 The Pinnacle Series™ of porcelain insulators is a full line of pin and line post insulators manufactured using the wet process method to ensure the highest levels of quality and long term durability. The Summit Series™ of composite silicone insulators include deadend and cutout insulators. The Duro Series™ of HDPE pin insulators utilizes high density polyethylene which is preferred by linemen and utilities both for its lighter weight, resistance to cracking and superior life expectancy. Local stocking for just in time delivery. Designed and engineered to meet customer specifications. Fast turn-around time for custom quotations. Friendly team of industry veterans with decades of experience serving utility customers.